Welcome! 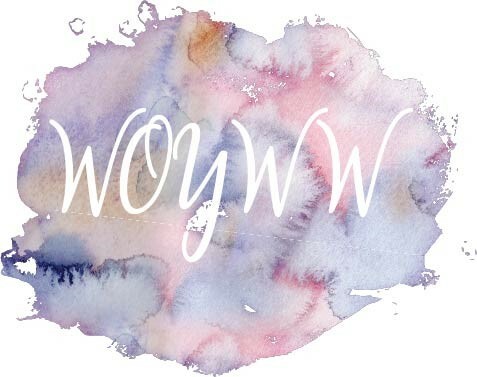 This blog is intended to record all my craft projects - scrapbooking, cardmaking, sewing, knitting, gardening - and anything else that catches my interest. 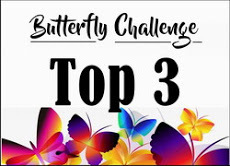 I hope you enjoy reading my posts and feel free to leave me a comment - they are always much appreciated! I have everything to smile about here today - the sun is shining and that always makes us feel a lot happier. Joining in with Annie's Friday Smiles, over at A Stitch In Time, I have a few photos to share; although you'll be pleased, perhaps, that this post isn't as photo heavy as last week's. 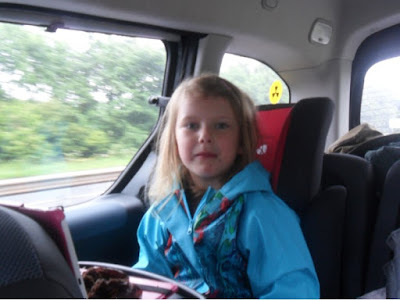 This photo of Arihanna, our great-niece, was taken on a trip to Edinburgh on Monday. Actually, we were on the way back and she's eating a chocolate muffin. The way she got it all over her face just made me laugh. This is the latest addition to my daughter Juli's family and he's adorable. 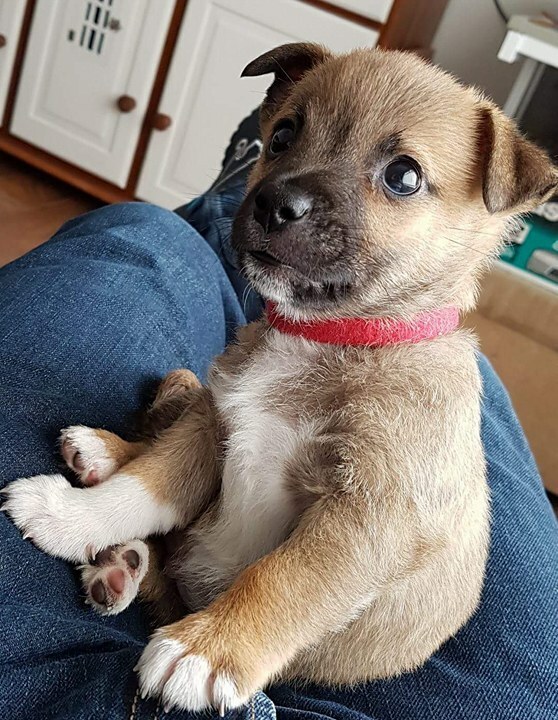 He's just a few weeks old in this photo - he's a Jack Russell cross. Now named Pepsi (after Juli's favourite cold drink) the breeder called him Mr Red to distinguish him from the rest of the litter, hence the red collar. Almost done but here's another shot taken in Dundee. 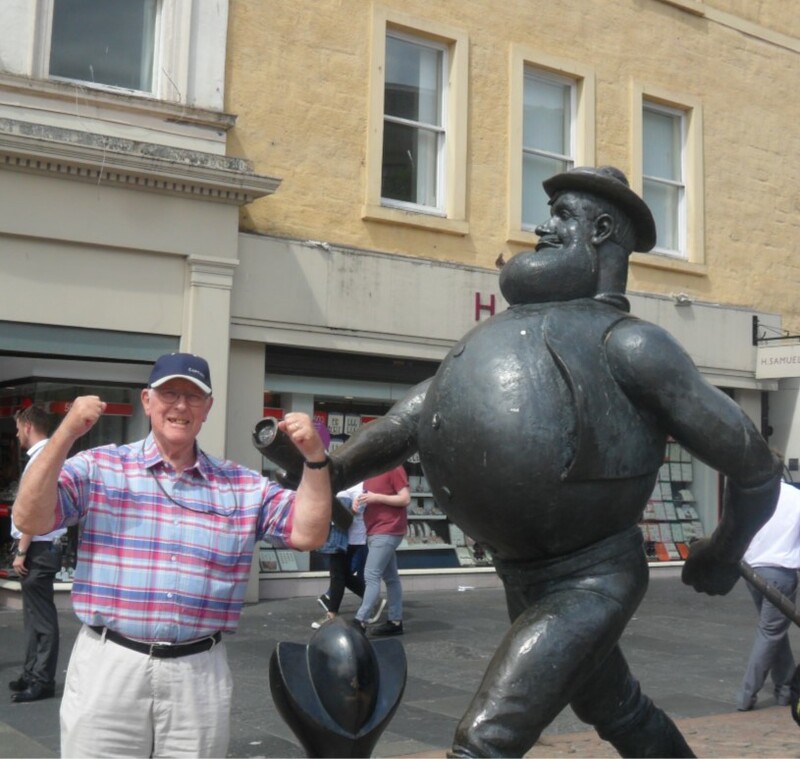 Desperate Dan, a very popular character from the 'Beano' comic. He's 'the world's strongest man' but my DH couldn't resist trying to prove otherwise. No contest! Finally, my favourite rose is in bloom again. 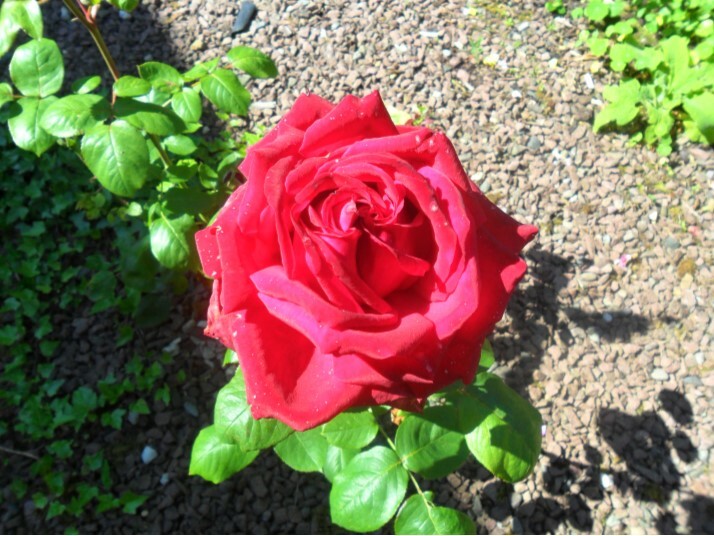 Unfortunately, I've forgotten it's name but it always reminds me of the Robert Burns song, 'My Love Is Like A Red, Red Rose'. Just perfect! I could go on but I think that's enough for one day. I hope you've all had a week full of things that made you smile and I wish you a wonderful week to come too. What a lovely post. I smiled at Your hubby with Desperate Dan. I remember the comic, but didn't remember him having such a huge beer belly! Puppy Pepsi is gorgeous of course and I will look forward to seeing more pictures of him as he grows. Arihanna is very good in that she doesn't have chocolate all over her jacket, just on her face. And that is allowed in my book. Oh that rose! It is beautiful! I'm late, I'm late for a very important date!....I had my first customer through my door at 8 this morning and have had a steady flow since so have had my head down sewing til now so only just checking out all the smiles. What a little cutie Pepsi is....I'm sure there will be lots to smile about with that one. As for your hubby....I'd never call him desperate hehehe...it sure made me chuckle. I just read that you didn't get the joke about the bathroom. I think you are Reading too much into it. It was just so cruel to put the toilet paper so far from the toilet. Can you just imagine yourself hobbling, pants down, to go get some? That alone made me laugh! Vegetable flowers In a Vase on Monday.